In recent years the problems of "range anxiety" associated with electric vehicles (EVs) have been alleviated by the introduction hybrids (HEVs) and plug in hybrids (PHEVs) and the development of higher energy density batteries capable of storing more energy in the same space. With the increasing popularity of electric vehicles, "range anxiety" is now being replaced by "charging anxiety". This page addresses the issues associated with providing suitable chargers and the charging infrastructure necessary to support the growing population of EVs. It takes about three minutes fill up a petrol or diesel engined car at a filling station with enough fuel to travel about 300 miles, costing about $35 in th USA and about £52 ($80) in the UK. To travel 300 miles in a small EV passenger car would need three full charges of a typical 25kWh battery used to power these vehicles costing about $2.50 per charge in the USA with electricity priced at $0.10 per unit (kWh) and £2.50 ($3.90) in the UK with electricity priced at £0.10 per unit. The low energy cost is one of the attractions of owning an EV. Unfortunately to put the 25 kWh of energy needed to travel each 100 miles into the battery in the same time (1 minute) that the equivalent amount of diesel fuel is pumped into the tank would require a power supply capable of delivering a power of 1.5 MegaWatts. To put this into perspective, 25 kWh is the amount of energy an average household consumes in a whole day. Providing electrical distribution facilities to allow users to consume this amount of energy from the electricity grid in one minute is not practical and even if it was, no EV battery could accept energy at this rate. On the other hand neither is it practical to take 24 hours to charge the battery in a passenger electric vehicle. The solutions don't just involve the development of chargers, they involve the design and roll out of a network of public and private charging stations with associated user authentication and billing systems, public safety and planning issues, the negotiation of international standards and beefing up the electricity grid to carry the increased load. There are no single answers to these issues. On the one hand, national and international standards organisations attempt to find definitive solutions to these issues, but there are so many competing national standards. On the other hand commercial enterprises attempt to leapfrog the competition by coming up with new and unique innovative solutions to differentiate their offerings. Some of these issues are explored here. First we need to scope out the requirements of the vehicles we are trying to accommodate and the batteries they use. The range is very wide with energy storage requirements ranging from 0.5 kWh to 50 kWh and current carrying capacity ranging from 20 Amps to 200 Amps requiring chargers purpose built to suit the applications.The table below provides a summary. Note: High charging rates can cause accelerated ageing. Most cell manufacturers recommend charging rates less than the C Rate typically 0.3 C to 0.5 C. This would mean recommended charging times between 2 and 3 hours. Chargers provide a DC charging voltage from an AC source whether from a common socket outlet or more recently from a purpose built DC charging station. Most important are the methods of controlling the charge and protecting the battery from over-voltage, over-current and over-temperature. These charger functions are integrated with and unique to the battery. 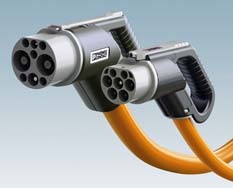 Chargers for electric bikes are usually low cost, separate units. To save weight they are not usually mounted on the bike and charging takes place at home. Their power handling capacity is only sufficient for charging the relatively low power bike batteries and entirely unsuitable for passenger car applications. Chargers for passenger cars are normally mounted inside the car. This is because the vehicle may be used a long way from home, further than the range possible from a single battery charge. For this reason they have to carry the charger with them on board the vehicle. Charging can be carried out at home from a standard domestic electricity socket outlet but the available power is very low and charging takes a long time, possibly ten hours or more depending on the size of the battery. Since charging is usually carried out overnight this is not necessarily a problem, but it could be if the car is away from its home base. Such low power charging is normally used in an emergency and most cars are fitted with a higher power charging option which can be used in commercial locations or with a higher power domestic installation. In many countries this higher power facility is implemented by means of a three phase electricity supply. Commercial electric vehicles need bigger batteries which need higher power charging stations to achieve reasonable charging times but they also have extra options. Many of them follow prescribed delivery routes within a limited range from base and return to base in the evening. In these cases off board charging is possible saving weight and space on the vehicle. Such applications can also be adapted to battery swap options. Each vehicle may have two batteries with one being charged while the other is in use. When used in long distance shuttle applications this can double the effective range of the vehicle. The vehicle depletes the battery during each journey and picks up a fully charged battery at the terminus leaving the discharged battery to be recharged ready for the next trip. This shuttle option however needs three batteries per vehicle. Early HEVs used Nickel Metal Hydride batteries, but they are mostly being superseded by a range of variants of Lithium ion batteries which is the technology of choice for most new EV applications since they can store more energy and deliver higher power. For this reason most EV chargers are designed to work exclusively with Lithium ion batteries. For more details about charging methods see the section about Chargers. Charging stations merely deliver the energy to the vehicle, usually in the form of a high voltage AC or DC supply. They don't normally have the functions of the charger which must transform the electrical energy into a form which can be applied directly to the battery. From the wide range of potential consumers noted above, it can be seen that the EV community needs several power supply options. Broadly speaking, three different power levels have been defined but within these levels a very wide range of options are available to accommodate the different existing power grid standards of the national electricity generating utilities. Level 1 refers to Single Phase Alternating Current (AC) using grounded receptacles as used in domestic applications. In North America this typically means 16 Amps at 120 Volts delivering 1.9 kW of power. In Europe it may be 13 or 16 Amps at 240 Volts delivering 3 kW of power. The EV may incorporate a standard domestic power cord to connect the vehicle to a domestic socket outlet or a Level 1 charging station. Level 2 delivers up to 20 kW of power from either Single or Three Phase Alternating Current (AC) sources of 208-240V at up to 80Amps. In North America, the J1772 standard has been defined by the Society of Automotive Engineers - SAE to cover the connector and charging cable used in Level II applications. 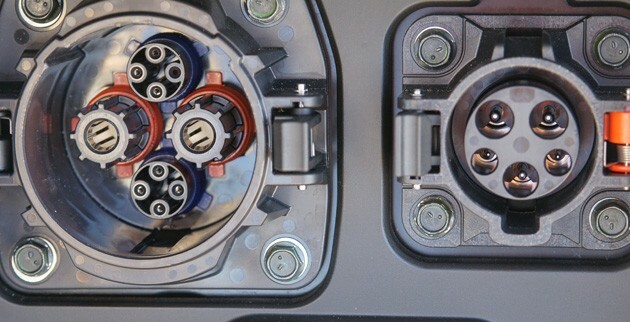 These cables are permanently fixed to the Level II charging station rather than the vehicle with the male connector being mounted in the vehicle itself. The connector is also commonly called a "coupler". Individuals can install a level 2 charging station at home, while businesses and local government can also provide level 2 charging for a fee or free if they wish. Level 3 refers to Direct Current DC charging, or “fast charging.” To achieve very short charging times, Level 3 chargers supply very high currents of up to 400 Amps at voltages up up to 600Volts DC delivering a maximum power of 240kW. Within this definition there are several competing industry / commercial standards including an SAE J1772 Hybrid coupler, the so called Jumbo, and the Japanese CHAdeMO. 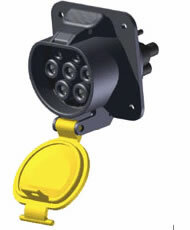 The J1772 combo coupler for example allows charging from either a conventional, 15-amp AC wall outlet or a DC connection of up to 90 kilowatts. These systems are being proposed for public fast charging stations. 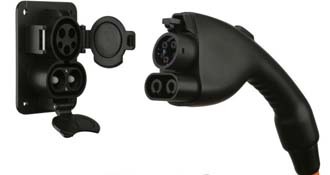 Examples of J1772 and CHAdeMO couplers are shown below. The diagram below illustrates how the key functions of Level 1, 2 and 3 chargers are implemented. All charging systems take AC power from the grid and convert it to DC power at a suitable voltage for charging the battery. In EV applications, except for bicycles, Level 1 and Level 2 chargers are completely contained within the vehicle. In Level 3 charging systems however the charging functions are split between the charging station and the vehicle's on board charger. In low power, Level 1 and level 2, applications the power conditioning which includes the AC to DC conversion, the power control unit which delivers a variable DC voltage to the battery, and various filtering functions are all carried out within the charger and can be implemented at a relatively low cost. The Battery Management System (BMS) is tightly integrated with the battery. It monitors the key battery operating parameters of voltage, current and temperature and controls the charging rate to provide the required constant current / constant voltage (CC/CV) charging profile and it triggers the protection circuits if the battery's operating limits are exceeded, isolating the battery if needed. See more details about BMS functionality on the Battery Management Systems page. The charger will also most likely incorporate CAN Bus functionality to integrate with other vehicle systems but not necessarily with the charging station. Safety measures in the relatively low power Level 1 charging station are fairly simple and may be limited to a ground fault sensing device and a circuit interrupting device (CID) or "circuit breaker", however the charger itself will usually incorporate more comprehensive safety measures in addition to the standard BMS functions including safety interlocks and isolators to prevent power being connected if there is a fault in the battery or the charger, as well as measures to prevent misuse, electric shocks and inadvertently driving away with the power cord still plugged in. Level 1 charging works from a single phase AC power outlet and is suitable for private, domestic installations and these do not need authentication and billing. If the charger is designed to work with public charging stations, as many Level 2 installations will be, it will most likely need to incorporate further intelligence to communicate with the charging station to verify that the user is authorised to draw power from that particular source and to allow it to bill the customer for the energy transferred unless charging is installed at home or as a free service in the workplace or shopping mall. Level 2 charging stations may use either single phase or three phase AC power from the grid. 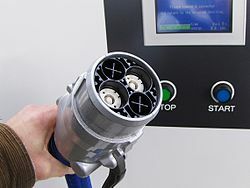 This self contained systems used for Levels 1 and 2 gives the charger the flexibility to connect to different AC charging sources. Level 3 chargers have the same functionality as the Level 1 and 2 chargers but with the very high power levels used, the AC/DC conversion and the power conditioning and control circuits become very large and very expensive requiring heavy duty components. It makes sense to carry out these functions in the charging station rather than the charger so that the equipment can be shared by many users. This allows major cost and weight savings in the vehicle's on board charger and with a bigger budget for the charging station, more efficient designs may be possible. In this case the BMS must communicate with the charging station to control the voltage and current delivered to the battery since power control is not implemented within the battery. The charging station however does not control how the batteries on the vehicle are charged. That is the function of the charger on the vehicle itself, and its battery management system. 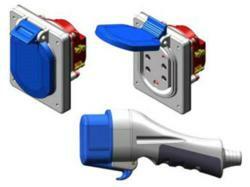 The charger provides this control by means of the CAN Bus which communicates its demands to the charging station. Safety functions for isolating the battery and protecting the vehicle's occupants are also managed by the charger and the BMS. While putting some of the traditional charger functions into the charging station permits cost savings in the vehicle, the charging station will be correspondingly more expensive. Level 3 charging stations currently cost between $20,000 and $50,000. On top of this there is the cost of providing access to the grid. Because of the high power requirements of up to 240 kWatts per station, they can't just be connected to the grid anywhere. The electricity generating utility must provide a dedicated supply line capable of delivering the very high currents demanded. One drawback of this system is that the vehicle can only be charged at compatible public charging stations. An example of a Level 3 quick charging system is the CHAdeMO system developed by the Japanese auto industries and proposed as a global standard. The name is an abbreviation of “CHArge de MOve", equivalent to “charge for moving”, and is a pun for O cha demo ikaga desuka in Japanese, meaning “How about some tea” (while charging) in English. The CHAdeMO "fast charger" is basically a current source which can deliver up to 62.5 kW of direct current at voltages between 50 Volts and 500 Volts via a proprietary electrical connector. The vehicle charger tells the charging station through the CAN Bus, the battery capacity, and at what level to set the voltage. Every 0.1 seconds the vehicle tells the charging station how much current to deliver following a very specific CC/CV charging curve profile defined in the CHAdeMO specification and finally it tells it when to stop. 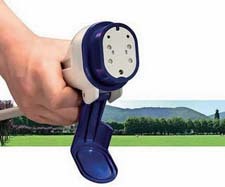 Safety interlocks are also managed through the CAN Bus which tests the charger circuit and the battery for any fault conditions (short circuits, high leakage currents, overheating) before the charging station can apply power to the connector preventing it from being energised before it is safe. In this way the charging process is essentially controlled by the vehicle. 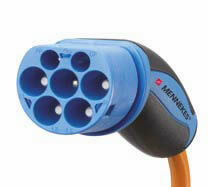 The SAE J1772 system provides similar functionality to the CHAdeMO system. The main advantage of inductive charging is convenience. It allows electrical energy to be transferred from the grid to a vehicle without the aid of wires. Energy transfer takes place by magnetic resonance coupling between two copper coils tuned to the same frequency, one embedded in the ground and the other mounted under the vehicle. The arrangement is essentially a transformer with the primary in the ground and the secondary in the vehicle. This is not a charger in itself. It simply replaces the direct connection to the grid. The AC power picked up by the secondary coil is applied to a normal charger such as the Level 1 and Level 2 chargers described above. The system has been in use for over 10 years in shuttle buses which follow a short well defined route, picking up energy at each bus stop from coils mounted in the road. It is not yet in common use in small passenger vehicles but design teams are working on suitable systems with power transfer levels up to 10kW. The principle of Inductive Charging is described in more detail in the section about Chargers. Charging rates for very large batteries may be limited by the capacity of the power supply resulting in excessive charging times and quick chargers have been developed to address this problem. However, just because a fast charging station is available it doesn't mean that you can reduce your charging times by connecting to it. First, fast charging systems use high power DC charging systems and, unless your vehicle has a compatible charger on board, the charging station will be no use to you. But more importantly, no matter what voltage or current the charger can deliver, the charging time is ultimately controlled or limited by the battery and the cells from which it is made and and how much current they are capable of accepting. Try powering a light bulb with a higher voltage than it was designed for and see how quickly it expires. The table below shows the charging times and associated charging currents for a variety of chargers used to charge batteries in a variety of vehicles. 1) The table assumes charging from empty. In practice most drivers will recharge before the battery is completely empty so that average charging times will be less than those indicated here. Furthermore, it is not recommended that batteries be used or left off charge until they are completely discharged since this could cause damage to the battery. 2) The table also assumes fast charging. Thus the charger only supplies current during the "constant current" (CC) phase of charging so that the battery is charged to about 80% of its capacity. To fully charge the battery to 100% of its capacity, the "constant voltage" (CV) charging phase would require the current to be reduced to an average of about 10% of its "constant current" value to complete the final 20% of the charge. This would, in the worst case, increase the total charging time of all batteries using CC/CV charging to 3.5 times the fast charging time. However with a well designed charging control system the average taper current during CV period may be increased resulting in a charging time of about 1.65 times the quick charging time to 80% capacity (or 1.3 times the full battery capacity in Ah divided by the CC mode charging current). See also CC/CV Charging in the section on Battery Chargers. 3) The table shows the minimum theoretical charging time for each application with different chargers assuming the full power of the charger is applied to the battery, in other words, the charger capability is fully utilised. Smaller batteries may not be able to use all of that capability however since the higher capacity chargers can deliver much more current than the smaller batteries can accept and so the current must be limited by the Battery Management System in the battery. On the other hand, the excessive charging times for the higher capacity batteries are governed by the capacity of the charger or energy source rather than the limitations of the battery. The values in the table's white cells (above) are thus impractical unless steps are taken to adjust the power levels accordingly, either in the BMS or in the source. If the charging current is curtailed by the BMS for any reason, such as reducing the current to a level that the battery can accept or interrupting it temporarily to avoid overheating of the battery, the charging times will of course increase as a consequence. This would be the case with Level 3 charging the EV passenger car in the table above, since no currently available commercial battery can safely be charged with a current of 8.5C. In this case a quick charging time of at least 30 minutes would be more reasonable, with the BMS reducing the current from the charger to 1.6C, nevertheless still a very high current. 4) While the charging rates shown in the table may be possible, they are not necessarily desirable. Cell makers typically recommend charging rates between 0.2C and 0.5C. Charging with the higher currents available from fast chargers can reduce the lifetime of the battery. Mark Perry, Nissan’s director of product planning has stated that, “If fast charging is the primary way that a Leaf owner recharges, then the gradual capacity loss is about 10 percent more than 220-volt (AC) charging." See also Charging Rate in the section on Battery Life. 5) The inefficiencies of the energy transformation in the charger have been taken into account in the above results. 6) As a baseline, in ALL CASES,using a charger with 15% efficiency losses and charging with a current of 0.5C (C/2) during the constant current phase and an average current of 0.05C (C/20) during the constant voltage phase, will result in a charging time of 1.9 hours to 80% capacity and a time of 6.6 hours to 100% charge. One of the main objectives of the Smart Grid is to make better use of the installed generating capacity. This will be achieved by offering differential pricing for electricity to encourage consumption to be switched from periods of high demand to periods of low demand and also by creating the ability for the utility to remotely turn supplies on and off locally to manage demand. When this eventually takes place, there will be consequences for the design and operation of charging stations. See more about the Smart Grid in the section on Electricity Demand. Proposed by electric utilities and academics, the V2G facility of the Smart Grid envisages the ability of electricity generating utilities to level the demand on their generating capacity by drawing energy from the batteries of EVs connected to the grid during the daylight hours of peak demand and returning it to the vehicles during periods of low demand during the night. Quite apart from the inconvenience, it would require charging stations to be capable of bi-directional power transfer incorporating inverters with precisely controlled voltage and frequency output to feed the energy back into the grid. It would also require the support of a massive communications network to manage the distributed power flows, the billing and feed-in buy back transactions. They expect users to be tempted by advantageous pricing and electricity buy back tariffs and in return, to use some of the available cycle life of their expensive batteries to service the grid for the benefit of the utilities. How much sooner will you have to replace your battery? What happens if your regular work schedule is suddenly disrupted and you return to your car two hours earlier than usual, only to find that the utility has drained all the energy from your battery? How will the resale value of the vehicle be affected? See more details about V2G in the section on Electricity Demand. Despite the major improvements in battery performance over recent years and the development of hybrids and plug in hybrids to solve the problem of range anxiety, the market penetration of electric vehicles remains stubbornly low. Even though the fuel costs of EVs are much lower than the alternatives the high price of EV batteries is one of the problems which still deters buyers. Though less publicised, the other major impediment to sales is charging anxiety. The concerns may be encapsulated in the following questions. Will my connector fit the charging station? How long will charging take? Will my car register on the network? Will quick charging be available?. There may be solutions to some of these problems but up to now the obsession with range has masked the very real problems of the availability of charging facilities. These issues are explored in the following paragraphs. One of the main reasons given for range anxiety was the possibility that there would be no, or few, charging facilities remote from the home base adding unacceptable risk to long journeys. While this is still the case, there's a much greater problem closer to home. Though some EV enthusiasts may live in leafy suburbs in houses with garages and driveways where they can connect their cars to the electricity supply, a very large percentage of the population, particularly in Europe, live in streets without gardens and have to park their cars in the street. They can not run an extension leads across the pavement to their cars to charge the battery overnight. Similarly the parking facilities for apartment dwellers may be in open parking lots with no access to electrical power. Even if the apartments have have indoor parking spaces, these ares not usually equipped with electrical power outlets. The solution to this problem could be to have on-street power outlets but this is very costly and very few local authorities or utilities are willing providing such a facility. The charging stations would also need to include authentication and billing systems and the communications to manage them. Even if the local authorities would provide on street charging stations, there simply isn't space to let cars hook up on the street for hours. It may be possible to offer charging facilities in company parking lots but it is not really practical in a residential area. Shopping malls could also offer the service but charging times will far exceed the typical shopping time. Charging while parked in a public space is also vulnerable to vandalism, particularly with the exposed power cable. For those fortunate live in houses with private parking, able to charge their vehicles at home, another issue arises. When they come to change or upgrade their EVs, their old EVs will be resold through the used car market, usually to buyers more likely to be living in less affluent communities without the luxury of private parking. The lack of parking facilities in their target market will no doubt have a negative effect on resale values. It may seem strange that parking is relevant to charging opportunities. It is not because of the access to the charging station, but because of the cost of the parking which can far outweigh the cost of the electricity. As noted above, the cost of 25 kWh of energy to charge an EV is about £2.50 in the UK. It takes about 6 hours to charge a battery with this energy. But typical city centre parking costs for 6 hours parking could be anywhere between £5 and £25 depending on the city. The parking costs ten times as much as the energy. Similar ratios apply in other major city centres. So the cost of parking must be added to the cost of charging the battery making it very expensive to fill up. Fast charging stations were designed to be installed in motorway service stations to enable EV owners to undertake long journeys exceeding the normal operating range of their vehicles. The fast charging systems employed are very expensive, $30,000 or more per unit to install and because of this, only very few are installed. This should not be a major problem when the population of EVs is also very small, nevertheless if several EVs turn up at the same time at the charging station, with charging times of up to 30 minutes or more, the last in the queue will have to wait a long time before the vehicle can be charged. This could make club outings of EV owners groups very difficult. If the popularity of EVs eventually takes off the result could be impossible congestion. Providing public charging facilities could be an attractive business proposition in the some circumstances, fulfilling a demonstrated need. Such services are still unusual and obtaining planning approval for such ventures is fraught with difficulties. With few precedents for the local authorities to rely on, objectors can make getting the necessary approval approval very difficult. In any case battery charging is not the kind of business local authorities like to promote for their city centres. Apartment dwellers also have problems to get charging points installed in their parking bays because local ordinance laws were not designed to cover this eventuality. Even if these difficulties are overcome, there's still the electricity utility to deal with. Providing power to several Level 1 and Level 2 charging stations or a single Level 3 charging station can overload their existing distribution network and a business case must be made for installing new capacity. Enthusiasm for EVs can wane when faced with all these difficulties. The net effect of these bureaucratic and technical hurdles is that there are still very few available public charging installations. Standards are another factor causing charging anxiety. There are so many of them. See the table below. When you get to a charging station, how do you know whether you will have a suitable coupler to connect to the charging station? 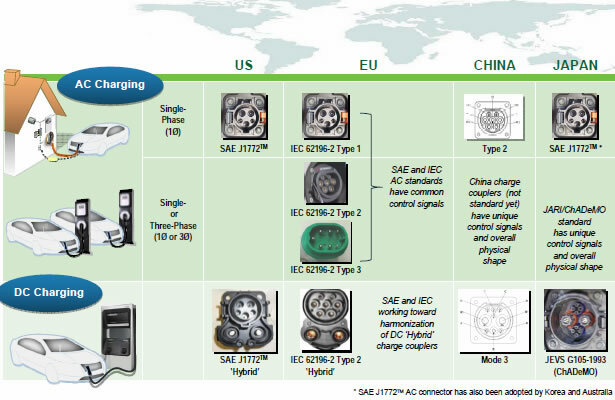 There are almost as many connector standards suitable for Level 1 chargers as there are nations. finding suitable charging stations when driving an EV across Europe can be a nightmare. The situation with Level 2 and Level 3 chargers is much better with fewer variants but compatibility between standards is still a problem. There is still no single worldwide standard for electrical and mechanical interfaces between chargers and charging stations and for authentication and billing systems. Even if you can make the physical connection, the system may not let you draw down any energy because the billing system may be different. The chart below shows a summary of couplers available for Level 2 and Level 3 charging. Paradoxically, the most difficult problem to solve is home charging for city dwellers and those dependent on on-street parking. In citiies like London there are many, many thousands of cars parked overnight on the streets. Unless the utilities or the local authorities provide charging stations, EV owners will have to park their vehicles in car parks with public charging facilities and walk the remaining distance to their homes. They will also have to pay for the cost of parking which blows a hole in the economic justification of EVs. This is not just an occasional cost or hindrance, it's an everyday expense and a major inconvenience. Fortunately some local authorities are providing designated on-street parking slots with charging facilities for small numbers of EVs, but this is by no means common. For those without private parking facilities, the hybrid vehicle is currently the only practical EV option. Away from home, travellers expect to re-charge at public charging stations and to park overnight in public parking facilities so the location of charging facilities and parking is less of an issue. Away from home the biggest problems are the lack of charging stations and the plethora of connector and charging standards. These are solvable problems. As the population of EVs grows, there will be more incentive for investing in charging stations and at the same time, the automotive industry is already recognising the value of unifying the various industry and national standards to create wider markets for their products. Solving these problems can provide the conditions for a virtuous circle, boosting sales and attracting more investment. The magic pill to get this process started is the availability of a low cost battery and this is the EV industry's major challenge.